Feels like Fall today!! Cooler temperatures, Friday Night Football and Mums are blooming! Fall is my favorite time of the year. It happens to be the best thing about living in Ohio, we have the most beautiful autumn season. I am kicking off this Fall season not with traditional fall colors but with a Denim and White Fall Table. It includes white pumpkins - so that officially makes it fall! I owe much Thanks to Alma from The Tablescaper for much of this table!! I purchased three of the items on this table with the HomeGoods/Marshalls Gift Card that I won a couple months back for the "Where do you keep it" Post. 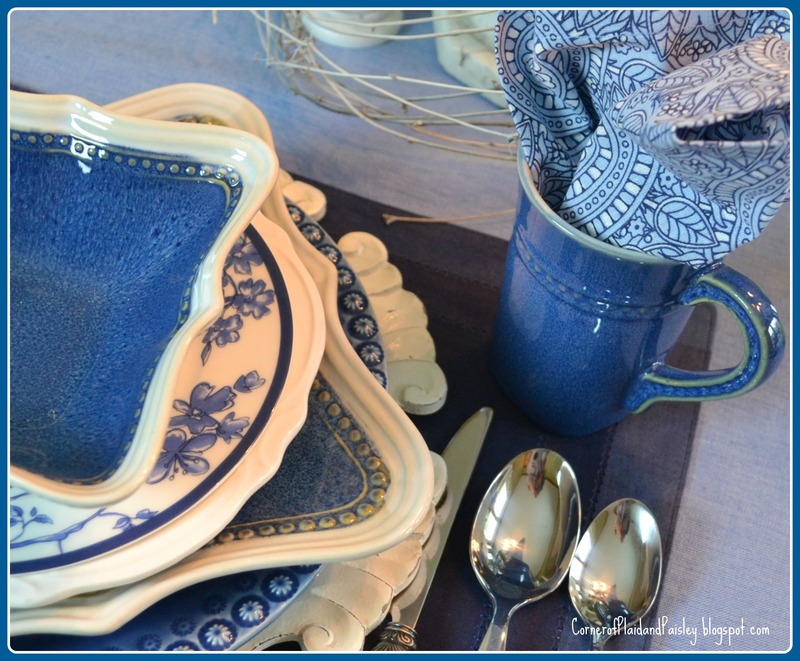 These denim plates, bowls and mugs were just the perfect addition to my dish collection. I am a denim girl at heart. I can't wait to get home from work and throw on my jeans. Weekends were made for jeans and fall was made for jean jackets! I wish I could say that these beautiful hydrangeas are from my garden but they aren't. I have the biggest most healthy looking hydrangea bush every year, but f it has not yielded more that three flowers total in the last five years! I think I need to add something to my soil. Even though these only cost me $4.00, it would be nice to just go out and pick my own. Also new for this table are the blue denim candles. These are Root Candles, made locally in Medina Ohio. They aren't cheap - but I just loved the color of these, and since I had purchased the denim plates with the gift card that I won from the Tablescaper, I decided to splurge a little with the candles. Here is hoping that this fall is a beautiful one -full of sunny days, crisp evenings and beautiful autumn color! I just love this table! The colors, the plates, the textures, so well done and so gorgeous too! Love the table,colors and the dishes. Your tablescape is very very pretty. thanks for sharing with us. I'm a denim girl too, especially during the cooler months. Your table definitely speaks to me! Great stack of dishes with both color and texture. Thanks for sharing. I am with you and Sarah - I love denim, but I tend to love all things cotton! The colors that you chose for the table are so fresh and pretty and adding the white pumpkins was so smart - totally fall. Everything looks wonderful and I do like those blue candles - they certainly make a statement! Well, I guess we all love denim, and this table is gorgeous, specially the pretty White and blue dishes, my fav... and perfect with the cute white pumpkins! I love Fall and your table says it all. I LOVE this table! I don't do traditional fall colors much in my house because they look out of place, but this would certainly be a good look for me. Lucky you to win the gift card! So pretty...love this color scheme for fall. The white pumpkins fit perfectly. I'm a denim girl, too, Ann. 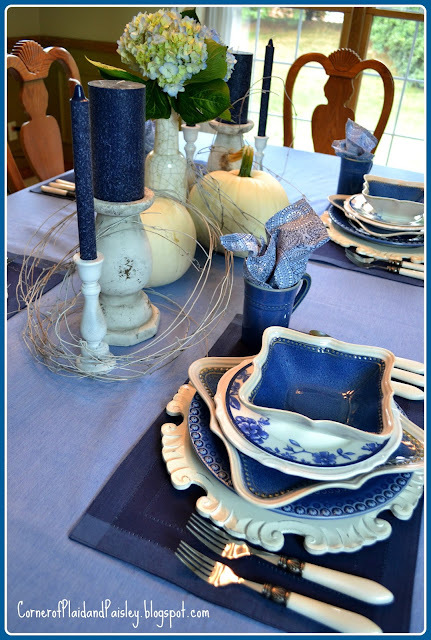 Your table is just so pretty decked out in blue denim and white. Did I ever tell you that I grew up in Columbus and it's where all of our children were born? I didn't know that Root candles were made in Medina. I love this table! Blue is my favorite color and the white pumpkins in the centerpiece are an unexpected treat! What cute denim dishes! I love what you've done with the blue and white! 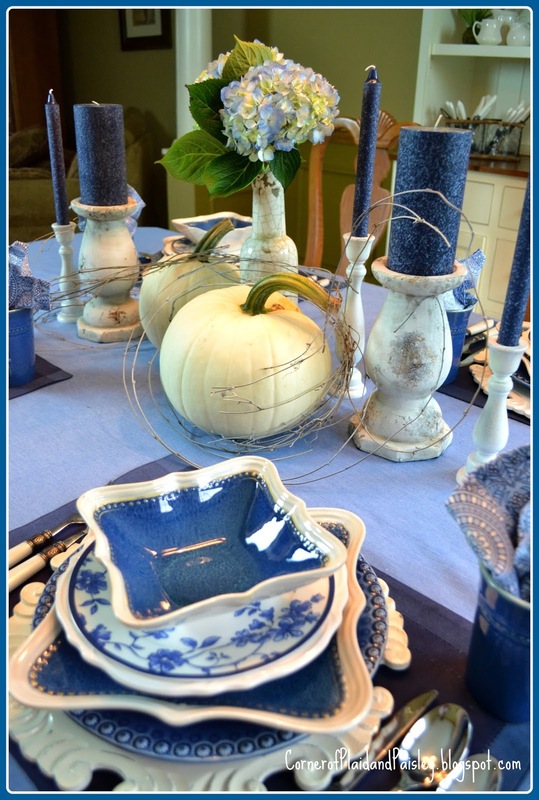 Love love this blue and white tablescape and the great touches of fall. Your denim china is so lovely and versatile. 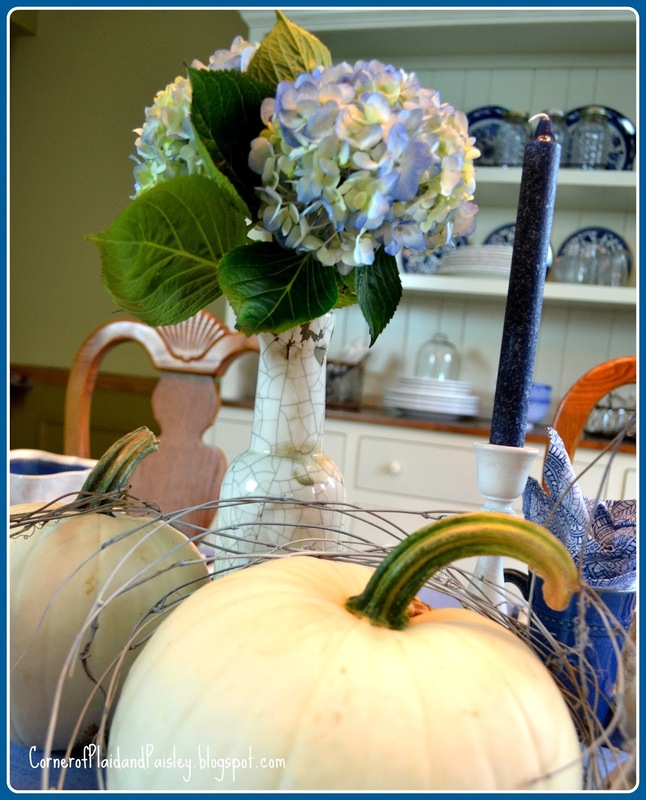 I like your pretty blue candles with the pumpkins in your centerpiece. Have a good week! Love this table and I love all of the blue and white. Those are amazing dishes. They didn't have those at my HomeGoods. I'm so happy that you were able to put the gift card to good use. What is the circular straw like thing (lousy description) you have around the pumpkin? It adds just the right amount of interest. Alma, those are grapevines that I sprayed lightly with some off white paint! I let their brown tone kind of show through the paint - hoping that they would blend nicely and more naturally than if I blasted them with white paint! 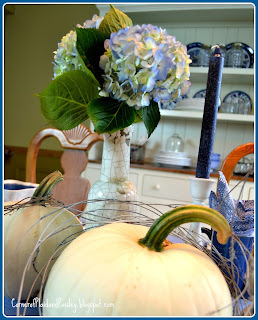 White pumpkins are my favorites and I love the way you've mixed them in with blue and white. Now there's an ideas I just may have to copy! What a gorgeous AND friendly table! 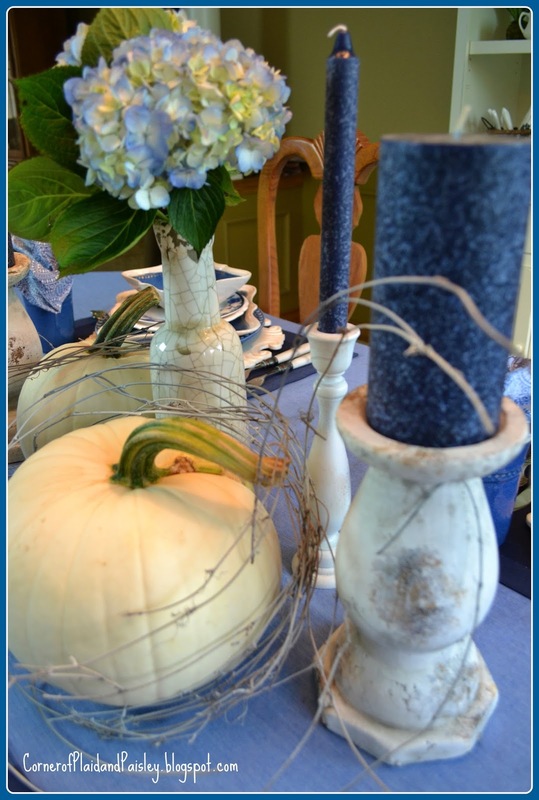 The touches of denim make it inviting, and the white pumpkins add a perfect fall touch! I don't usually this this combination of colors, but I love this for fall. I love blue and white tables, maybe because I vividly remember them from when I was a tiny child. I can't believe you even found some denim candles that go so perfect with your dishes! 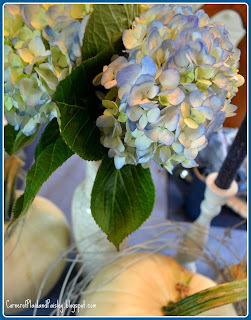 How pretty your fall denim's are - especially with those white pumpkins. Ann, I love this! 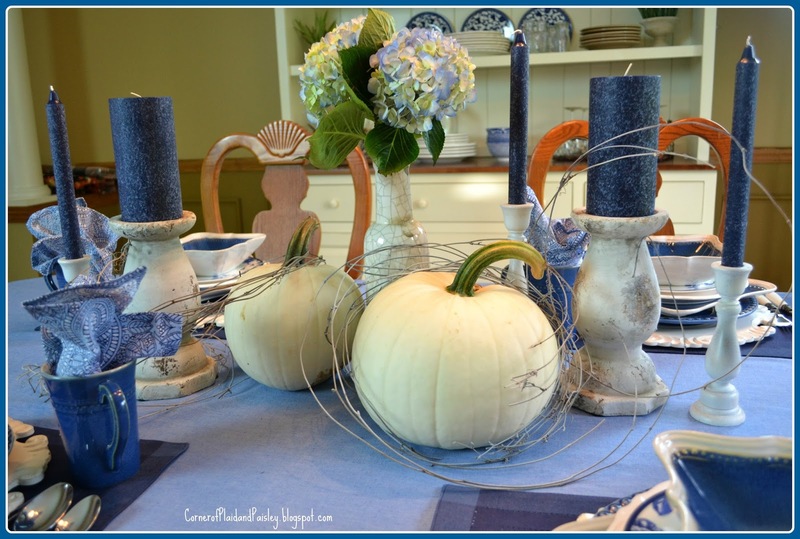 The denim blue looks so great with the white pumpkins. Blue and white is one of my favorite combinations! 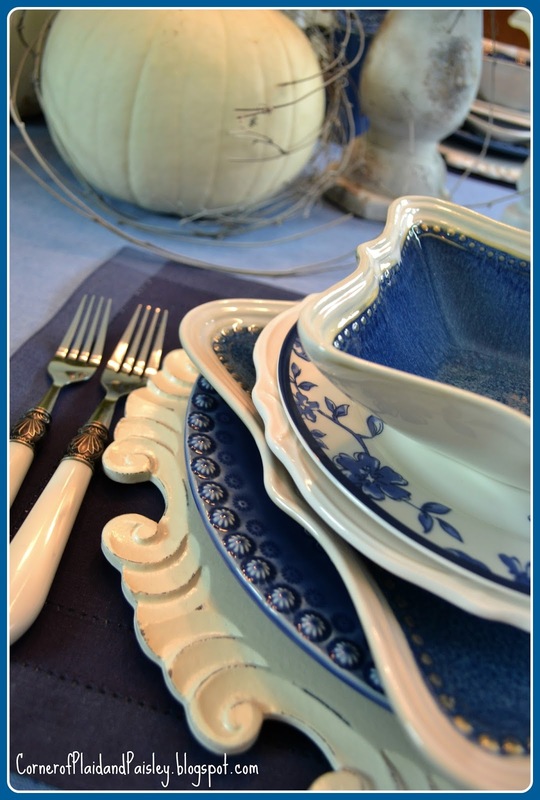 Those scalloped blue and white dishes are to die for. I wish I lived closer to a Home Goods so I could drop in frequently. It is hit or miss when I visit. Home Goods is one of those stores you need to check frequently.